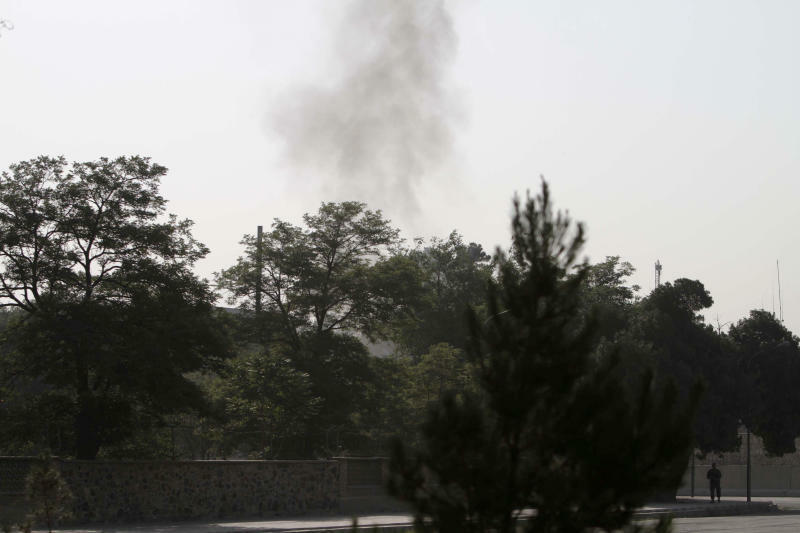 KABUL, Afghanistan (AP) — Suicide attackers blew up a car bomb and battled security forces outside Afghanistan's presidential palace Tuesday after infiltrating one of the most secure areas of the capital. The army said the attackers were killed but knew of no other deaths. The Taliban claimed responsibility for the attack, which came as reporters were gathering for a news event on Afghan youth at which President Hamid Karzai was expected to talk about ongoing efforts to open peace talks with the militant group. The palace is in a large fortified area of downtown Kabul that also includes the U.S. Embassy and the headquarters for the NATO-led coalition forces. Access is heavily restricted. It houses Karzai's residence but it was not immediately clear whether the president was in the building at the time and his spokesman did not answer his phone. Gunfire started around 6:30 a.m. inside a heavily guarded area near the east gate leading to the palace next to the Afghan Ministry of Defense and the former Ariana Hotel, which former U.S. intelligence officials have confirmed is used by the CIA. Kabul police chief Gen. Mohamad Ayub Salangi said three or four gunmen jumped out of their SUV and opened fire after being stopped by security forces while trying to use fake documents to get through a checkpoint. All gunmen were killed, and one palace security guard was wounded, he said. A car bomb then exploded as it tried to enter the area. About 20 journalists took cover behind a religious shrine, pulling a schoolboy off the street who had been caught in the open on his way to school. Taliban spokesman Zabihullah Mujahid claimed responsibility, saying in a text message the militants had "brought death to the enemy" with a suicide attack. He later suggested in an emailed statement that all three buildings had been targeted, saying the attack came "near the Ariana Hotel, the important CIA base, and also the presidential palace and Ministry of Defense." Smoke could be seen coming from the area of the hotel, but there was no immediate indication any of the buildings were hit in the attack. Mujahid claimed the attackers had inflicted "heavy casualties," but Afghanistan's Kabul division army commander Gen. Kadam Shah Shahim said he knew of no deaths among security forces or civilians. He said his forces killed all of the attackers after they jumped out of their vehicle and opened fire. The NATO-led coalition in Afghanistan instituted a camp lockdown during the incident and said in a short statement that its forces had been ready to assist but were not called in by Afghan authorities. The U.S. Embassy cancelled all consular appointments and advised American citizens in Kabul to stay indoors but had no immediate comment on the incident. The Taliban have indicated they are willing to open peace talks with the U.S. and the Afghanistan government and just last week opened an office in Qatar for possible negotiations. But at the same time they have not renounced violence and attacks have continued across Afghanistan.